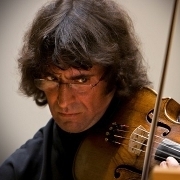 Yuri Abramovich Bashmet (born 24 January 1953) is a Russian conductor, violinist and violist. Through his virtuosity, strength of personality and high intelligence, Yuri Bashmet has given the viola a new prominence in musical life. The pre-eminent viola player of the modern age, he has motivated the leading composers of our time to expand the repertoire with significant new music. In addition to concerto and conducting appearances throughout the world, chamber music collaborations include projects with artists including Anne Sophie Mutter, Lyn Harrell, Martha Argerich, Vadim Repin, Evgeny Kissin. He is Principal Conductor of the Symphoy Orchestra of New Russia and founder/director of Moscow soloists.